PinSeeker with JOLT Technology to zero in on the flag. 5 yards-1 mile ranging performance (550+ yards to a flag). Pinseeker technology has always been a mainstay of the Bushnell laser rangefinders, but the Pro X7 has the latest and greatest version of it; E.S.P. 2 (Extreme. Speed. Precision.). Pair that with JOLT, there is almost no time lapse between pushing the button and getting the distance plus a nice little vibration(JOLT) to know you did. I rarely shot a pin twice with this technology. I did find though that it will JOLT on other thin objects like fence posts or narrow trees behind the green. If you happen to be on a course with those object behind the green, you may want to shoot twice just to confirm you hit the flag and not an object in the background. It JOLTs anytime you shoot a yardage and the object is narrower. I found people on the green will cause it to JOLT just like a pin. Obviously anything with a prism is a dead lock instantly, but even non-prismed items could get a good read and lock extremely fast. Impressed with ease of use and the extra accuracy on offer. On the slope version, it works out the adjusted distance for you. It’s much easier to get a JOLT on long approaches into par 5s with this. Feels heavy, but it is designed for two-handed use. Would be ideal if you were mapping a course for a comp a few days before as it’s very accurate and quick to give you slope-adjusted distances. Slope version illegal for competition use. Probably too much for the weekend golfer, but if you want the best in the business, this will not disappoint. Bushnell Rangefinder is the #1 laser rangefinder on tour. They added features to the Pro X7 to keep in at the top of the market. The improvements are significant and function extremely well during play. If you don’t mind the bigger size, this is the best rangefinder Bushnell has put out. The Pinseeker tech w/ JOLT is amazing. The x7 optics still offer the strongest magnification of an laser making it clearer, easier and quicker to shoot yardages to pins. 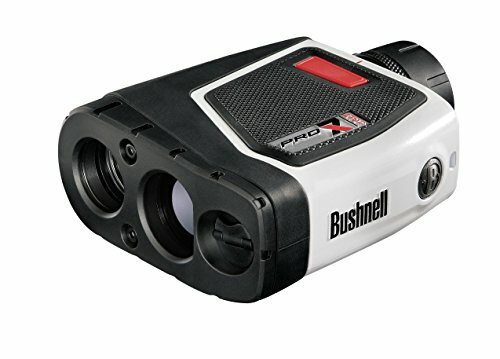 The Bushnell is the leading laser rangefinder and it just got a JOLT to stay on top with the Pro X7. Bushnell Pro X7 JOLT Rangefinder with Slope With its award-winning PinSeeker with JOLT Technology, E.S.P.2 Technology, and Vivid Display Technology, the Bushnell Pro X7 JOLT Rangefinder with Slope sets the standard for being the most powerful golf laser rangefinder in the world. JOLT Technology eliminates all doubt by delivering short vibrating bursts to reinforce that the laser has locked onto the flag.